"Limits of Israel's high-tech power"
This is what I am forced to read in the American press. I mean, is this journalism or IDF propaganda brochures? What's the difference: ""You're an officer now, so look after your soldiers, and always, always keep your eyes open," said his father, Yossi, who fought alongside two brothers in Israel's wars of 1967 and 1973 and was a 3-year-old child when his own father lost a leg to a land mine while fighting for the fledgling Jewish state in 1948." So do you see the impulse in the US press? They do a great job of humanizing Israeli killers, and a greater job in dehumanizing Arab civilians? I still can't believe that the Israeli government spends millions on propaganda in the US (it does). "Hours after a promised suspension of Israeli air attacks, the civilian survivors of some of the most intense fighting in the war clambered from the wreckage. They were shrunken figures, dehydrated and hungry. Some had lived on candy bars, others on pieces of dry bread. Some were shellshocked, their faces blank, the expression that comes from living under bombing for 20 days. One never made it. 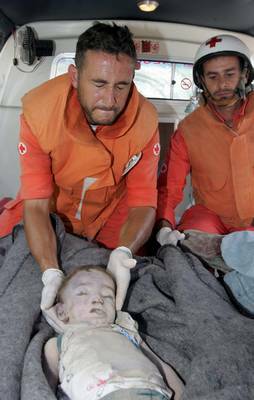 He was carried out on a stretcher, flies landing on lifeless eyes that were still open." (I am not a Christian. Don't forgive. Don't forget). 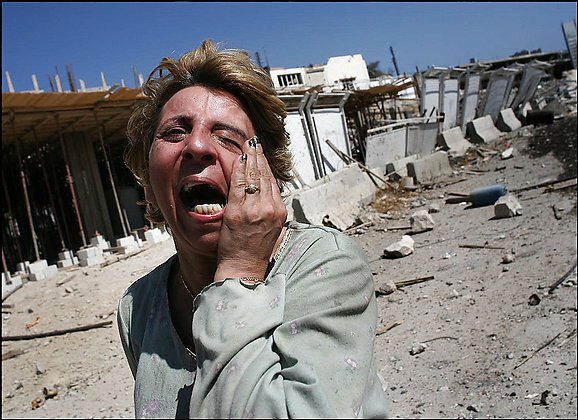 "Namad Baidoun, traumatized by 20 days of Israeli bombing, screams as she walks out of the shattered ruins of her village of Bint Jbeil in southern Lebanon." I had written an ode to Jimmy Carter before. Here, Carter offers his views on the Israeli war: "It is inarguable that Israel has a right to defend itself against attacks on its citizens, but it is inhumane and counterproductive to punish civilian populations in the illogical hope that somehow they will blame Hamas and Hezbollah for provoking the devastating response." Just look at the word "counterproductive." This is the Tikkun philosophy. Basically, it means: that "we" would be supportive of Israeli wars and occupations if "we" think that they are good for Israel. So Carter here is saying that if the Israeli killing spree in Lebanon was good for Israel's security, he would jump up and down in support. This is a corrupt man. I just finished reading the official biography of Al-Walid Bin Talal. You have to read what this ostensible champion of human rights have to say about Al-Walid--especially in the accompanying DVD of the book, who donates money to Carter's silly and patronizing projects. And then he says this: "Leaders on both sides ignore strong majorities that crave peace." Oh, no, o Mr. Carter. Oh, no. Nobody wants the kind of "peace" that you produced at Camp David. Please spare us. Are you not writing a new book on potato slicing? I am really looking forward to reading that one. And it promises to be more interesting than your previous books. After the Israeli killing sprees in Lebanon, I am not in the mood to hear one word about the investigation of Hariri's assassination. Not a word. Maybe if you investigate Israeli massacres in Siddiqin, Tayr Harfa, Srifa, Nabatiyyah, Qana, Marwahin, and others, I may reconsider. He would not dare speak in public: "Kofi Annan told Jack Straw of his anger at Britain's stance on the conflict in a phone call last Wednesday to the former foreign secretary, it emerged last night. The UN secretary general rang Mr Straw hours after Britain and the US blocked a call for an immediate ceasefire at the Rome summit, and a day after Israel bombed a UN monitoring position, killing four observers." "[T]he king of fairyland would be forced to come to terms with the consequences of Israel's occupation of other people's lands and of its murder of civilians; of his own invasion of Iraq and of his failure, across the past six years, to treat the Palestinians fairly. And this he seems incapable of doing. Instead, his answers last Friday suggested, Bush is constructing a millenarian narrative of escalating conflict leading to the final triumph of freedom and democracy...The United States cannot pursue a wider settlement in the Middle East, for it is led by a man who lives in a world of his own." 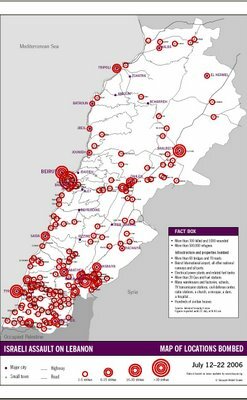 Lies of Israel: "The 48-hour pause in bombardment announced by Israel to allow civilians to leave southern Lebanon was interrupted within hours of its start yesterday when the Israeli military launched three air strikes at targets near the border." Israeli-Mayors-for-War: ""There is no cease-fire, and there will be no cease-fire in the upcoming days," Olmert promised to the cheers of mayors in attendance. Conference participants made it clear they want the operation to continue." How could anybody in Lebanon make a defense of the Syrian regime anymore? I mean, really. Here is a regime that used to justify its military presence on Lebanon on grounds of military-strategic needs of the Arab-Israeli conflict, and here is a regime which has defense treaties with Lebanon. And look at it. The Asad family can care less about the destruction of Lebanon as long as they remain in power. (Of course, the wonderful Syrian people are a whole different matter. They have ignored the blatant racist anti-Syrian manifestations of Lebanonese demonstrators and politicians and have welcomed with open arms Lebanese refugees). Qatar today officially accused "some Arab governments" of supporting the Israeli war of aggression on Lebanon. Zionist potatoes. Today, Israeli occupation troops fired at a truck carrying potatoes. They later claimed that the potatoes were bearded and could have very well been supporters of Hizbullah. Like Zarqawi, Zionists kill truck drivers and poor workers. I find it most offensive these days to read in Saudi-funded media former pathetic propagandists for Saddam Husayn now posing as advocates of "democracy" and "liberalism." Where do I go? Not to Disneyland. Zionism and House of Saud. Saudi columnist, `Abdur-Rahman Ar-Rashid, says that Israeli prolonging of the war beyond the two-weeks "embarrassed its friends." But Zionism deserves House of Saud. Zionism does not deserve better than that. In fact, they both deserve one another. A perfect fit, if you ask me. Gamal `Abd-u-n-Nasser should never be forgiven. He is most responsible for the 1967 defeat, which instilled and expanded in Zionism this arrogant and massive use of violence against Arabs--a factor that was always a key element in Zionism of course. Nasser's loyalty to his incompetent friend, "General" `Amir, cost us not only that war, but the successive wars that Arabs lost to Israel. This does not absolve other Arab regimes. No. But nobody has faith in the rest. Arabic newspapers have reported that Shi`ites have demonstrated in support of Hizbullah in Saudi Arabia. Now that the House of Saud is on the side of Israel, American Zionists would support any oppression and all executions in the kingdom. That Zionist-Saudi alliance is kind of amusing, if you think about it. Even the anti-Semitism of the House of Saud is now forgiven by supporters of Israel. Not only is the cowardly and useless Lebanese Army refraining from defending Lebanon from Israeli attacks, but it also preventing Palestinians from helping in the defense of Lebanon. This Army should be disbanded. It is an embarrassment to the country and a huge waste of tax-payers money. 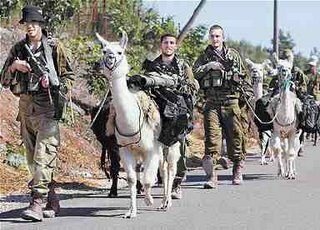 Israeli occupation troops (ab)using the lamas in their terrorist missions in Lebanon. "Three of my colleagues went to Tyre today. I will spare you the details of what they saw and wrote. Only one thing that I need to share with you. Saada went to Jabal Amel hospital. There she found the following: a four year old boy, Hassan Chalhoub, had spent the previous night between the dead, in the morgue. He was sleeping next to his sister , zeinab ,6 , in the shelter in Qana. There was his mom too and his dad, who’s on a wheeling chair. Many of the people of Qana are survivors of the 1996 massacre , when 110 people were killed and more than 100 were injured when by Israeli raids on civilians who had sought shelter in a nearby UN base. Thus , many of the people of Qana have special needs, if you see what I mean. She saved her husband, thinking that someone had already taken care of little Hassan. She and her husband spent the rest of the night the closest house, where the civil defense workers had taken them. The next morning, they took them to the hospital. Hassan was thought dead. They put were they put the other kids. HE woke up in the morning, opened his eyes to see a two year old girl lying next to him. He thought she sleeping. He looked around, and luckily found a man “Ammo, what am I doing here ?” he asked. The man couldn’t believe his eyes. His mom , Rabab , told him the following “she’s having fun in heaven. There are no Israelis there, she’s happy there”. Grand (never) Ayatullah Sistani issued a statement agaisnt Israeli aggression in Lebanon. It reads: zzzzzzzzzzzzzzzzzzzzzzzzzzzzzzzzzzzzzzzzzzzzzzzzzz. House of Saud's propagandist (and Saudi embassy in DC advisor (and "former" Bin Ladenite), Jamal Khashuqji, distances himself from the opinion of anti-Shi`ite cleric, Nasir Al-`Umar. "THE devastation that is being wrought in Lebanon — the destruction of civilian infrastructure, the death of hundreds of innocent civilians, the displacement of well over half a million inhabitants, the deliberate collective punishment of an entire population in an attempt to defeat Hezbollah — is not simply Israel's doing. It is also America's." 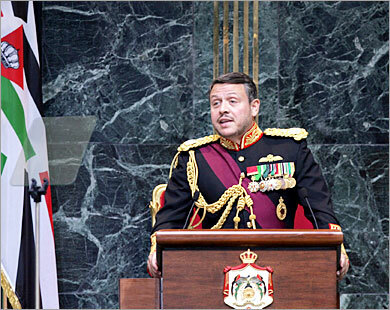 The Syrian president ordered an increase in the level of "preparedness and alertness" of the Syrian armed forces. The preparedness and alertness of the Syrian armed forces is measured on a scale from 0 to 5. So yesterday, it went up from -80 to -70. I took notice. I wish I am kidding, but I am not. Today, mini-Hariri landed in Cyprus. 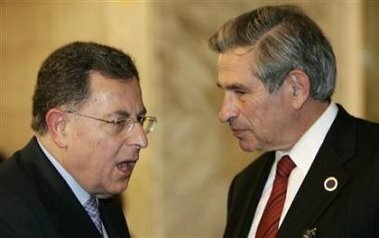 He urged the Cypriot government to end the war in Lebanon. 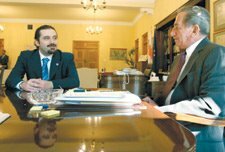 The president of Cyprus (seen above with mini-Hariri) promised to not bomb Lebanon anymore. The people of Lebanon expressed their gratitude to mini-Hariri for saving them form Cypriot attacks on their country. Karen Hughes studies the Middle East: "Her nighttime reading is telling. A re-reading of Bernard Lewis' What Went Wrong? Western Impact and Middle Eastern Response. Alaa Al Aswany's The Yacoubian Building, about a building in Cairo and all its inhabitants. And, at her bedside, evangelist Billy Graham's new book, The Journey: How to Live by Faith in an Uncertain World." Ad-Diyar newspaper, which seems to be receiving funds from Qatar as of late (in addition to funding from Al-Walid bin Talal who must not have enjoyed Ayyub's labeling of the Saudi King as "criminal" and "Zionist"), reported on the behind-the-scenes negotiations that averted a storming of the US embassy in Lebanon. Hizbullah, Amal, and the Lebanese Army all worked hard to avoid (and cancel) a demonstration in front of the US embassy in `Awkar outside of Beirut for fear of things getting out of hand. Many of the demonstrators yesterday were refugees from South Lebanon. Hizbullah's Support among the Shi`ite refugees. Make no mistake about it. The surprising show of support among the Shi`ite refugees from South Lebanon for Hizbullah is only partly due to sectarian bonds of solidarity. In the ugly world of Lebanese sectarian politics, each sect is pushed toward a sectarian group or leader. And the sectarian lines are more sharply drawn now in the wake of that famous Hummus Revolution. Narrow sectarian identities now prevail more than ever, and Shi`ites feel, rightly or wrongly, that Hizbullah is what they have to protect members of the sect, especially that secular parties have all but died in Lebanon, and the Syrian Social Nationalist Party squandered a great opportunity (for pushing secularism that is) by becoming an arm of Syrian intelligence in Lebanon. But that is not the whole story. 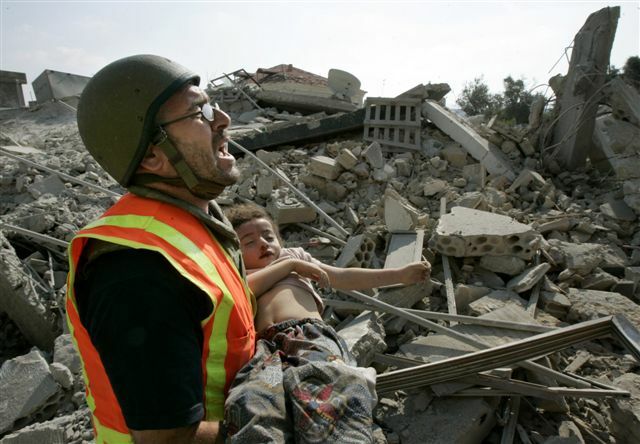 Israel and US were expecting the refugees to blame Hizbullah for Israeli bombings and destruction the way many South Lebanese Shi`ites blamed (so unfairly) the PLO for Israeli crimes in Lebanon in the early 1980s. This time around it did not happen. The main reason in my opinion is the very performance of the party and its fighters. In other words, if the fighters fled quickly in the face of Israeli attackers (as many Lebanese and Palestinian fighters did in 1982 not out of cowardice but due to the lousy and corrupt management and leadership of Yasir `Arafat--who has not sent millions to Suha `Arafat in a while now (my mother hates it when I attack `Arafat; she admires his asceticism), then the refugees would have easily turned against them. This time around, the stiff resistance exhibited by Hizbullah fighters solidified the bonds between the party and the Shi`ites, and it enhanced, not hampered, the image of the party. 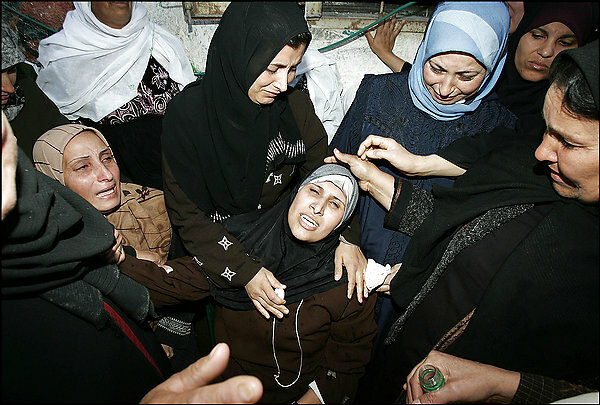 Has there ever been an Israeli massacre in which Zionist perpetrators did not lie about it? Ever? Collective Enthusiasm for War in Israel. Yesterday I saw a demonstration against the war in Jerusalem. I swear, I counted 8 demonstrators. Only two of them did not look Arabs. 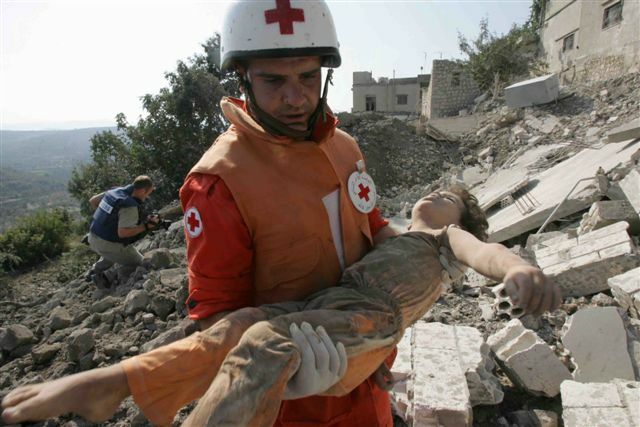 Israel kills more terrorists: "The Lebanese Red Cross, which conducted the rescue, counted 27 bodies, as many of 17 of them children. The youngest of the dead was 10 months old, and the oldest was 95. One was in a wheelchair." Human Rights Watch: "Israel Responsible for Qana Attack." (But notice that lousy last sentence by Kenneth Roth. In other news, I received the original and unpublished cartoon above about Roth (by Lattuff). (Kathy and Amer did not like the cartoon. They were worried that it could be misinterpreted. I don't know the cartoonist; I am assuming that the cartoonist (who knows Norman Finkelstein who sent this cartoon to me) did not have bad (anti-Semitic) intentions. As it is--at the risk of sounding defensive--it merely refers to the pro-Israeli political inclinations of those who fund Human Rights Watch). The Hizbullah Body Language: read all about it. This is what American readers are reading: "We could identify them as part of Hezbollah by the way they behave, their age group and their body language." What a sad state of the US press. Micheal Young discovers that sectarian feudal warlord, Walid Jumblat, is a genius. His evidence: "he surfs the Internet at night." The leader of the Lebanese sectarian movement that called for the withdrawal of Syrian troops from Lebanon in the name of sovereignty and independence says: "We need a force that can cover all of Lebanon, like in Kosovo." Enjoy the batata revolution of Lebanon. Fake French Intellectualism and the Middle East: the case of Bernard-Henri Levy (Levy should be good for the intellectual self-esteem of Americans. You read him and you immediately laugh at the sense of French intellectual superiority): ""J'ai connu, depuis quarante ans, bien des ministres de la défense d'Israël. De Moshé Dayan à Shimon Pérès, Itzhak Rabin, Ariel Sharon, j'en passe, j'ai vu se succéder les héros, les demi-héros, les tacticiens de génie et de talent, les habiles." Tikkun has a full-page ad in the New York Times--as always, the premise is (like in Paul Krugman's) what is good for Israel and the "anguish" of Israeli occupation soldiers. But how dare Lerner begin the ad with this: "In the name of our sisters and brothers suffering and dying in Lebanon, Israel, and the Occupied Palestinian Territories." Now, they very well may speak on behalf of Israel, but the day that Tikkun speaks on behalf of Arabs is the day when I will deny my Arab roots. Please tell Tikkun to NEVER EVER speak on behalf of Arabs. The American Left and the Middle East: the case of Paul Krugman. I believe that Krugman is one of the sharpest columnists; his criticisms of the Bush administration have been quite effective. But you have to understand that American liberals are willing to tolerate from Israel what they would never tolerate from their own American government. Look at Krugman: "There's no question of this war having been sold on false pretenses; unlike America in Iraq, Israel is clearly acting in self-defense." And in case you missed that point, he later repeats it: "Again, Israel has the right to protect itself." As for the violence and destruction, this peaceful American liberal is willing to even provide a road map of bombings and devastationn: "There is a case for a full-scale Israeli ground offensive against Hezbollah. It may yet come to that, if Israel can't find any other way to protect itself. There is also a case for restraint-- limited counterstrikes combined with diplomacy, an effort to get other players to rein Hezbollah in, with the option of that full-scale offensive always in the background." Now don't you think that I was expecting Krugman to say anything different. I have lived too long in the US to harbor any illusions about the American left on the question of Israel. Basically, the difference between the American Left and the American Right on the subject of Israel is in the degree to which they want Israel to kill Arabs and grab their lands. They usually engage in oneupmanship here. Why are they laughing? Well, Qana, of course. They think it is hilarious. "A Jordanian protester is held by security men during a rally at the Jordan University, Monday, July 31, 2006." Today, the Israeli military claimed victory. They said that they managed to kill a top Hizbullah leader. His name is Jihad `Awdah. Jihad who? Jihad `Awdah. Who is that? I don't know, and I am supposed to be an expert. Yesterday, Israeli military claimed that they killed another top Hizbullah leader: Billy Bob `Awdah. 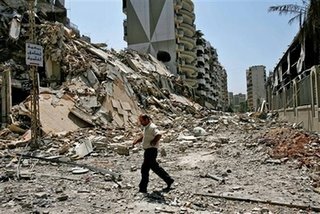 "A resident walks past a mound of rubble which used to be a high rise apartment building in the southern suburbs of Beirut, Lebanon". 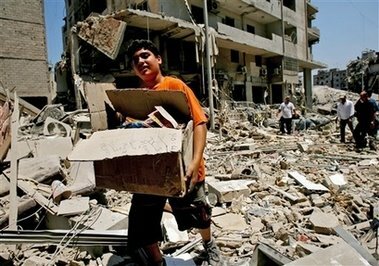 "A Lebanese youth carries a box of toys which he retrieved from his apartment, behind, in the southern suburbs of Beirut, Lebanon, Monday, July 31, 2006." "Iraq's vice president on Monday accused Israel of carrying out "massacres" in Lebanon, the strongest criticism yet of the Jewish state by a top official of the U.S-backed Iraqi government. Vice President Adel Abdul-Mahdi, a Shiite, singled out Sunday's Israeli airstrike that killed at least 56 Lebanese, mostly women and children, in the village of Qana. The deadliest attack in nearly three weeks of fighting has triggered an international uproar. "What happened in Qana is a repetition to these crimes that happened to our nation decades ago. It's time for this nation to stand up and stop this aggression and all forms of aggression that could affect any of its parts," Abdul-Mahdi said. "These horrible massacres carried out by the Israeli aggression, incites in us the spirit of brotherhood and solidarity," he said in a speech attended by Iraq's president, the prime minister and other top government officials." Lies of Israeli propaganda: "Israel says hits 2/3 of Hizbollah's heavy missiles". In other news, Hizbullah yesterday lobbed 150 missiles--more than any other day since this Israeli war of aggression started-- on targets in Israel. The new Lebanese newspaper, Al-Akhbar, is about to be launched any day now. "MR. FRIEDMAN: You know, these are people who, who hate others more than they love their own kids, more than they love their own future. And that’s crazy, and that’s part of the pathology of that part of the world. But one thing I know for sure, you know, what we’re doing right now, what Israel’s doing right now—smashing things in Gaza again, smashing things in Lebanon—I understand it." Even the demagogic TV religious speaker, `Amr Khalid, has spoken on the Israeli war of aggression on Lebanon, and he seems to disagree with Saudi Arabia. You switch Arabic channels, and you read different Arabic newspapers and you so regularly hear and read that "the US government is running" this Israeli war of aggression on Lebanon. Is that not true? Lebanese women holding a Beirut vigil in memory of those killed Sunday in Qana. "More Israeli lies and propaganda: I was watching Fox news again tonight for my daily dose of propaganda. One correspondent was describing how he was allowed to accompany Israeli soldiers to record their attack on Taibeh. The reporter was told by the group's captain that the aim was to destroy all the houses of the village to keep Hezbollah terrorists from using it in the future. The correspondent waited for hours till the soldiers came back, and the captain told him that they had successfully completed their mission. The reporter, who could see Taibeh from a distance, remarked that all the houses still seem to be intact, exactly as they were before the "successful" attack. Not being one to admit defeat, the captain replied (I am not making this up) that the damage was all internal. What the hell does that mean, internal damage!??? So, according to the IDF, here is what happened: after hours of heavy bombardment and erecting a ring of fire around the village, a group of battle hardened interior decorators attacked and changed the interior arrangement of every single house, then retreated with only few casualties. Let this be a lesson to Hezbollah and all other terrorist organizations. What's next, attack of the landscape divisions? More Israeli lies and propaganda: again from Fox (before I shut it off in disgust): When asked about the possibility of rockets being launched from the location of the Qana massacre, Major General Edwards, a US military Fox consultant who is solidly pro Israel, said that after looking at an aerial map, there is no possibility that rocket launchers could have been used in that area. He was also eagerly awaiting the results of Israel's investigation into the massacre. Isn't it amazing how the US media never questions the sensibility of the accused investigating the accusation?" In the demonstration in downtown Beirut, there were many flags. I saw the flags of the Lebanese Communist Party, the Syrian Social National Party, among other local Lebanese parties. Let us not reduce all anti-Israeli politics in Lebanon to Hizbullah. It is well beyond Hizbullah. It is beyond beyond Hizbullah. "US begins building treaty-breaching germ war defence centre"
"They wrote the names of the dead children on their plastic shrouds. " 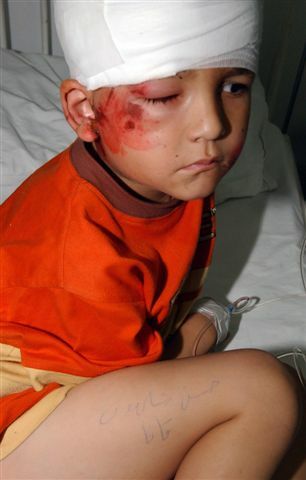 Mehdi Hashem, aged seven ­ Qana," was written in felt pen on the bag in which the little boy's body lay. "Hussein al-Mohamed, aged 12 ­ Qana", "Abbas al-Shalhoub, aged one ­ Qana.'' And when the Lebanese soldier went to pick up Abbas's little body, it bounced on his shoulder as the boy might have done on his father's shoulder on Saturday. In all, there were 56 corpses brought to the Tyre government hospital and other surgeries, and 34 of them were children. When they ran out of plastic bags, they wrapped the small corpses in carpets. Their hair was matted with dust, most had blood running from their noses. You must have a heart of stone not to feel the outrage that those of us watching this experienced yesterday. This slaughter was an obscenity, an atrocity ­ yes, if the Israeli air force truly bombs with the " pinpoint accuracy'' it claims, this was also a war crime. Israel claimed that missiles had been fired by Hizbollah gunmen from the south Lebanese town of Qana ­ as if that justified this massacre. Israel's Prime Minister, Ehud Olmert, talked about "Muslim terror" threatening " western civilisation" ­ as if the Hizbollah had killed all these poor people." 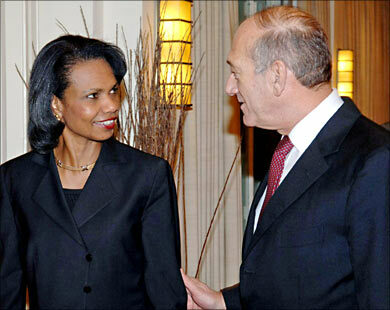 Don't you like fuzzy bipartisanship: "The war in Lebanon is creating a warm political consensus. Senator Chuck Schumer (Democrat, NY), normally one of the administration's most vociferous critics, said Sunday that "he has no criticism of the president on this issue."" Ze'ev Schiff has a word for the Qana massacre: "incident". This is a headline from the UK's Guardian: "Fresh ground assault on Hizbullah villages". Now we have Hizbullah villages, cities, bridges, roads, hospitals, children, women, houses, fields, factories, and sea. "The US state department's annual reports on terrorism also list operations carried out against the Israeli Defence Force as examples of terrorism. The US government justifies this conclusion by way of a logical contortion that defines Israeli troops as "non-combatants", despite the fact that Israel continues to occupy territory in Lebanon and Palestine with military force. The intention is not just to stamp out terrorism as commonly understood, but also to stigmatise perfectly legitimate acts of resistance." "How can 'terrorism' be condemned while war crimes go without rebuke? Washington's partners in this hypocritical war on terror are given free rein to wreak their own brutal, illegal violence""
"'They found them huddled together'"
There was a coup d'etat in Lebanon yesterday. Beirut has changed, and not to US/Israeli liking. In two days, a seismic change in Lebanese political attitudes can be noticed. And I am not only talking about public opinion. I am talking about the opinion of members of the Hariri coalition. In the last two days alone, all those Sunni Hariri deputies have clearly distanced themselves from remarks made by Walid Jumblat (although they have not named him): Muhammad Qabbani, Bahiyyah Al-Hariri, `Ammar Huri, Ahmad Fatfat, Samir Al-Jisr, among others). Bahiyya Hariri yesterday criticized the US "green light" on AlJazeera TV. Many of these politicians called AlJazeera live to express their condemnation of Israel and US. Many of them sounded as if they were pleading for their lives. The demonstrators yesterday, who stormed in the UN building in downtown Beirut where my sister works, chanted angry slogans not only against Arab regimes, Israel, and US, but also against Hariri. One chant went like this: "Beirut shall always be free, free; Hariri get the hell out." The demonstrators were planning to head to the US embassy, but Hizbullah and Amal members of parliament present prevented them. They clearly were afraid of things getting out of hand. They almost did. The second time around it could be ugly. I could see that; it is worrisome. 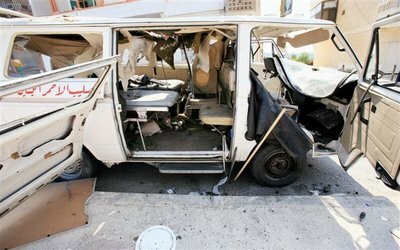 The car of the Ping Pong Minister (Hariri acting Minister of Interior Ahmad Fatfat) was attacked. One demonstrator according to the right-wing sectarian Christian daily, AnNahar, asked the press to note that she was Sunni. An-Nahar among other newspapers noted that the Sunni Al-Jama`ah Al-Islamiyyah was heavily present in the demonstration. Yesterday, marks the end of the Hariri coalition in Lebanon. You can read its future on the face of Walid Jumblat--when he shows his face to the press as he has confined his interviews as of late to phone interviews. And the "decision" by Fu'ad Sanyurah yesterday was not his decision. There was a coup d'etat in Lebanon yesterday. Nabih Birri visited the prime minister and requested that decision. Sanyurah, the Abu Mazen of Lebanon, had no choice. The "street" was boiling, and his master, Sa`d Hariri, was nowhere to be seen. He was asking for a cease-fire from....Tunisia. The longer the Israeli aggression continues, the more the scale will weigh heavily to the side of Hizbullah. And then you think of those smiling faces around Bush in the White House's National Security Council who only a week ago thought, so foolishly and callously thought, that they were in the midst of a great Middle East politics game. They so eagerly were waiting for the results of Israeli aggression in Lebanon. They thought that they were doing some classical British Empire's manipulation of regional developments. Americans don't know yet. They don't know how more unsafe Bush has left them/us. They don't know what a mess Bush has made in the Middle East and beyond, well beyond. The catastrophic results of Bush's foreign policy will be seen, nay suffered, for years and decades to come. And his Secretary of State is the living proof that a PhD does not make you smarter. And there will come a time, I hope, when Americans will also realize that Israeli terrorism is exactly the same as that of Al-Qa`idah. Qana Massacre II. But don't cry for him. He was launching Hizbullah missiles into your beloved Israel. Tough words from moderate former Lebanese prime minister, Salim Huss, to George W. Bush. Ghassan Shirbil, editor-in-chief, of the Saudi daily Al-Hayat, wrote this: "The Southern Lebanese is born waiting for his martyrdom. Life is a bridge hanging between two funerals. The land is treacherous and the sea is treacherous. Whenever a child is born, a bomb is born to hunt him/her down. This is our flesh minced under the rubble. This is our flesh splintering in every direction. This world is desolate. This world is savage. After 10 years, the killer came back to the scene of the crime, and slit the throat of his victim, again." On the day of the Qana Massacre II, Walid Jumblat condemned "Syrian interference in Lebanese affairs." Pierre Laval of Lebanon said this yesterday: "We used to think that Israel's goal was peace." Would somebody tell Anthony Shadid that there are some Lebanese who don't agree with Walid Jumblat, just in case he has not noticed. ""We have to acknowledge that they have defeated the Israelis. It's not a question of gaining one more village or losing one more village. They have defeated the Israelis," he said. "But the question now is to whom Nasrallah will offer this victory."" The history of earlier drives into Lebanon shows that even as the Israeli war machine gains momentum, so do the chances of terrible accidents and atrocities. In 1982, under the protection of Israeli forces, Christian Lebanese militias carried out the now infamous massacre of hundreds of Palestinians in Beirut's Sabra and Shatila refugee camps. Ten years ago, during a campaign against Hizbullah similar to the one now underway, Israeli gunners blasted a United Nations monitoring post at the South Lebanese town of Qana, where terrified locals had taken refuge. More than 100 civilians were killed in a barrage that lasted only a few ghastly seconds. International outrage quickly forced Israel to end its offensive. The Israelis say they are being more careful this time around, not least because they don't want to be forced to stop. "The presidential approval by Bush, the surprising level of support he's giving Israel, the patience he's giving Israel—it looks as if there's a great amount of slack being cut to us," says a senior Israeli security source, who did not want to be identified by name because he is not authorized to speak on the record. "Absent a Qana, it might go on." The question now is whether this tragedy will be enough to prevent others." "Today is a day when we Arabs really should be spared the language and terminology of the American press. "Accidents" and "tragedy" are not the words. Not today, Mr. Dickey. Not any day, Mr. Dickey. "Blair and his ignorant Foreign Secretary have played along with Israel's savagery with blind trust in our own loss of memory. It is perfectly acceptable, it seems, after the Hizbollah staged its July 12 assault, to destroy the infrastructure of Lebanon and the lives of more than 400 of its innocents. But hold on a moment. When the IRA used to cross the Irish border to kill British soldiers--which it did--did Blair and his cronies blame the Irish Republic's government in Dublin? Did Blair order the RAF to bomb Dublin power stations and factories? Did he send British troops crashing over the border in tanks to fire at will into the hill villages of Louth, Monaghan, Cavan and Donegal? Did Blair then demand an international, NATO-led force to take over a buffer zone--on the Irish, not the Northern Ireland side, of the border? Of course not. But Israel has special privileges afforded to no other nation. It can do exactly what Blair would never have done--and still receive the British Government's approbation. It can trash the Geneva Conventions--because the Americans have done that in Iraq--and it can commit war crimes and murder UN soldiers like the four unarmed observers who refused to leave their post under fire." He wrote this before Qana: "And having seen the cadavers of so many more men and women, I have to say--from my eyrie only three miles from the Israeli border--that the compliant, gutless, shameful refusal of Bush, Rice and Lord Blair of Kut al-Amara to bring this bloodbath to an end sentenced many hundreds of innocent Lebanese to death. As I write this near the village of Blat, which has its own little list of civilian dead, it's quite clear that many more innocent Lebanese are being prepared for the slaughter--and will indeed die in the coming days." " "Look," he says, pointing to a blown-up highway interchange. " It's a terrorist bridge! And if you take the road to Zahle, you'll find a burned out terrorist flour and grain lorry!" If the world became a better place, I fear Cody would contemplate suicide." ""Zawahiri is not any better than [President] Bush. They're both terrorists who kill innocent people," said Ahmad Sabri, 19, who was having lunch with a friend at a Chili's on Palestine Street." "Hezbollah's fight with Israel, viewed widely here as a battle between the militia's David and the Jewish state's Goliath, has solidified support for the militant group and left U.S. credibility, already at an all-time low, in tatters. The conflict has highlighted how far apart the United States and the majority of Arabs stand on the most visceral conflict in the Middle East." "The U.S.-Israel strategy of pounding Hezbollah could also backfire, former Bush officials warn. "Don't get me wrong -- if I thought that this air campaign would work and would eliminate [Hasan] Nasrallah and the leadership of Hezbollah, I think it would all be fine," former deputy secretary of state Richard L. Armitage said on National Public Radio this week. "But I fear that you can't do that from the sky and that you're going to end up empowering Hezbollah and perhaps introducing a dynamic into the body politic in Lebanon that will take some great period of time to recover from."" ""The U.S. is alienating even more world opinion, not to mention allies, for the sake of a strategy that is very likely to fail," said Augustus Richard Norton, an expert on Lebanese Shiite politics and a former U.N. peacekeeper in Lebanon." "Nauseating. It started out with "Well, Israel didn't know there were civilians there" and went to "It's all Hezbollah's fault anyway" to "Maybe Hezvbollah actually blew up the building after the Israeli airstrike" when Israel admitted that it was them "Israel didn't know there were civilians there". I've watched it spun ten different ways in about 5 hours." On the day of Israeli-massacre-at-Qana-II, the New York Times had this picture on the front page of its print edition with this caption: "Israeli paratroopers sang on Saturday as they returned to Israel from Lebanon, carrying a wounded comrade." Here we have a past...a present..
O, our living root, cling firmly"
On the day of the Qana massacre, I read this: "Israeli Soldiers Deal With Grief, Trauma"
San Francisco Chronicle is on most days one of the most liberal newspapers in the US. 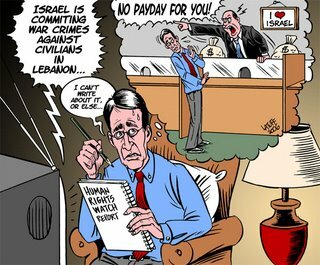 In this war of aggression on Lebanon, it has been most insensitive and most propagandistic for Israel. "The Cabinet revolt against Tony Blair intensified last night as Jack Straw broke ranks to condemn Israel for causing "death and misery to innocent civilians"." He got his courage after leaving office. "The standoff stunned Israel, whose offensive came in response to a Hezbollah cross-border raid that resulted in the death of eight Israeli soldiers and the capture of two others. Central to the embattled nation’s sense of survivability is the idea of its invincibility. Its intelligence knows everything, the mythology goes, and no army dare stand against it. In truth, Israel has, in part, been lucky in its enemies, mostly Arab regimes with armies suitable mainly for keeping their own populace in check. Although the Israelis announced within days that they had destroyed 50 percent of Hezbollah’s munitions, the guerrillas have continued to rain more than a hundred rockets a day on Israel. And on Wednesday, in Bint Jbail, a town the Israelis said they controlled, a well-laid Hezbollah ambush pinned down infantrymen from the elite Golani Brigade for hours. At times the firing was so heavy the brigade’s soldiers could not return it; eight Israelis were killed. The highly advanced Merkava tanks were reduced to ambulances and several were destroyed." "As terrorist groups go, do you think Hezbollah is worse than Hamas? Hezbollah is far more extreme than Hamas. Hezbollah is an organization that denies the legitimacy of Israel." (Don't ever use the word "dove" to describe A.B. Yehoshua in my presence). Israeli Prime Minister on Qana. "Olmert: Hezbollah used Qana as base to launch 100s of rockets", so we decided to kill all the women and children who are launching these rockets. I proudly announce to the Israeli nation that we have succeeded in killing a large number of the women and children of the enemy today, and will kill more tomorrow. This is the essence of Zionism. 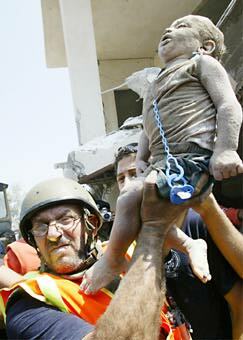 And we shall continue to kill their women and children; this has been the mission of our proud IDF. And if anybody protests, we can easily call those women and children terrorists--whether they are PLO, Hizbullah, Communists, it does not matter. As the only democracy in the Middle East, we have the moral duty to kill their woman and children. I ask the people of Israel to stand behind the Israeli army in its moment of glory as they continue to kill the women and children of Lebanon and Palestine. And I have received the full support of the US administration (and 70% of the American public), and the US Secretary of State assures me that she only hears the "pangs of birth" of the New Middle East with every cry and scream from women and children under the rubble all over Lebanon. Secretary Rice has asked for more cries and screams of women and children in the rubble of destroyed buildings in Lebanon because she strongly feels that the "pangs" are very necessary for the birth of its "New Middle East." A neo-con is selected by the New York Times to review a book by a neo-con: "Ajami’s American sensibilities come through most powerfully in his discussions of the American soldiers he meets in Iraq, from generals like David Petraeus to anonymous enlisted men. Ajami honors and respects their dedication, their optimism and their genuine desire to improve Iraq, and he quotes whole pages from their e-mail messages." Blair and Middle East Studies. Today (yesterday), I had a chance to get a glimpse of US TV news coverage, on the way to and from Berkeley, I had access to US TV channels through my satellite radio. CNN is worse than Fox News. In fact, on Fox, their correspondent in Beirut was quite good in talking about Israeli harm to civilians. The anchor was not pleased, and she immediately asked the correspondent in Israel (Jennifer something) to provide some news about the harm to Israeli civilians. She went on to speak about Israeli bombing of civilians in Lebanon. The anchor was not pleased at all, and was not amused, and ended the coverage. CNN's coverage is anchored by the Israeli-American, Wolf Blitzer. I mean this guy started his "journalistic career"--even before serving as a correspondent for the Jerusalem Post--by writing for the publication of the Israeli lobby. But now, he is an objective reporter for CNN. And Brent Sandler can't be taken seriously--he is considered a staffer of Hariri Inc in Lebanon, and now is serving as a cheerleader for Israeli aggression on Lebanon. I mean, just watch him. Is "that" a foreign correspondent? And then I heard Tony Blair calling for Hizbullah to leave South Lebanon? What does that mean? In every village in the Tyre region where I come from, more than 80 % of people are either members or supporters of Hizbullah. 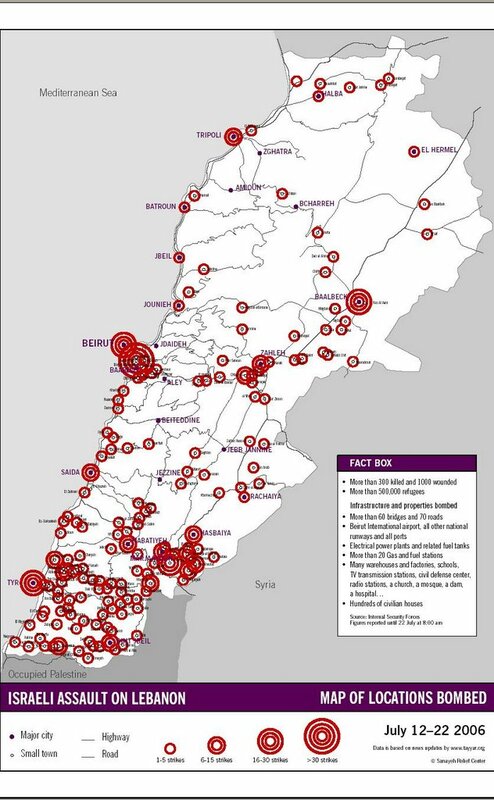 So is Blair calling for the expulsion or extermination of 80% of people in South Lebanon? Enlighten us, o blair. 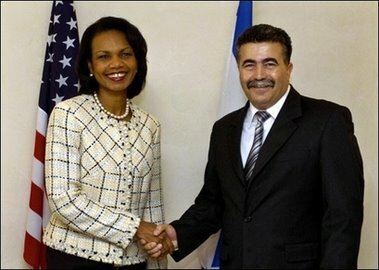 Qana Massacre II: Condoleezza Rice gets her "New Middle East." 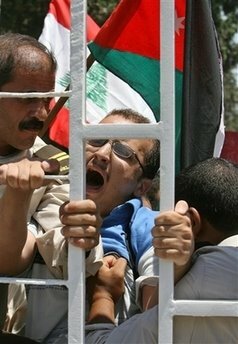 This picture was taken almost at the same time when Israeli planes were bombing women and children in a shelter in Qana. "Two weeks into the fighting between Israel and Hizbollah, Wednesday's battle - 'the longest day', one newspaper called it - may have marked a bloody turning point. Indeed last night Israel announced it was pulling its ground troops out of Bint Jbeil, saying it had accomplished its objectives there and dealt a heavy blow to the militant group, but admitting it had paid a heavy price with the lives of Israeli soldiers. Heavy indeed, as it was a withdrawal, not a victory. Hizbollah fighters still hold Bint Jbeil." "Tony Blair was facing a full-scale cabinet rebellion last night over the Middle East crisis after his former Foreign Secretary warned that Israel's actions risked destabilising all of Lebanon. Jack Straw, now Leader of the Commons, said in a statement released after meeting Muslim residents of his Blackburn constituency that while he grieved for the innocent Israelis killed, he also mourned the '10 times as many innocent Lebanese men, women and children killed by Israeli fire'." At this time: all Arab TV networks are covering live the recovery of bodies--children and women mostly--from the Israeli massacre in Qana. You saw them digging out children from under the rubble. Viewers were warned about the images. AlJazeera's correspondent, `Abbas Nasir, broke down. Even the pro-Bush AlArabiya TV had to interrupt its Saudi stock coverage to go to Qana. AlJazeera is now reporting on a new Israeli massacre in Qana. 35 are dead, and 21 are children. I have a cousin who lives in Qana. AlJazeera's correspondent `Abbas Nasir lost his composure. I switched to AlArabiya TV: and they were reporting on the Saudi stock market. These are the standards of the New York Times: "There is a difference between justified and smart. Israel's airstrikes against Hezbollah targets are legitimate so long as Hezbollah wages war against Israel and operates outside the control of the Lebanese government. But the air campaign is now doing Israel more harm than good." So the New York Times (as it says later in the editorial) only objects to the mass killing of Arabs if it hurts Israeli propaganda: "And more weeks of television screens filled with Lebanese casualties, refugees and destruction would be a propaganda bonanza for the Hezbollahs and the Hamases." Otherwise, the New York Times would have no problem with the killings and destruction. I live in Israel and I am a Jew. We don't all support the policies of Olmert or the policies of the Labor party either. And many of us grieve for the loss of lives in Lebanon and Palestine just as deeply as you grieve for those lives. I am sorry that this is happening to your country and I hope and pray that your family and friends will be safe and I hope that not one more Palestinian must die for the crimes of the state, the Israeli state. I would like to leave Israel before my son turns of age where he must serve in the military, I will not have my child be a part of an occupying army. 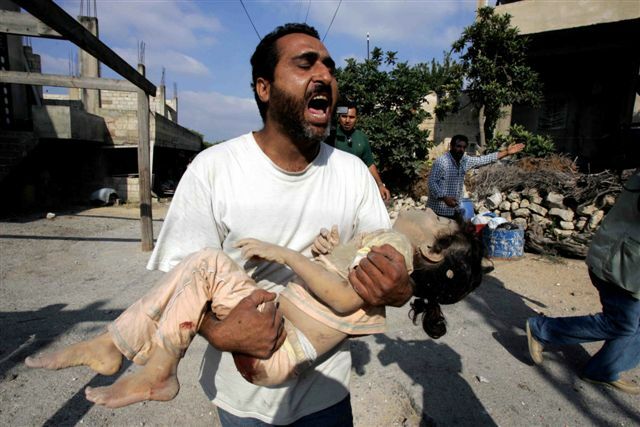 I don't want my child to have the guilt of the death of your loved ones or of Palestinians on his heart. Please know that we are all not like the thugs that visit your blog and say cruel and callous things. I abhor the messages they leave on your blog and they are not representative of Judaism. Zionism is not Judaism. One day the Jews around the world will realize this fact and I hope that when they beg you and Palestinians for forgiveness that you will forgive them for the spiritual malaise that has afflicted them. Lies of Israeli propaganda. Two days ago an Israeli military commander said that Nasrallah's deputy was killed by Israeli bombs. Today, Shaykh Na`im Qasim spoke to Reuters. Ahmad Sa`id (Nasser's radio propagandist) now speaks Hebrew. Who would have thought. Nasrallah's new address. In this one, Nasrallah atypically reads from a written text although he added some while reading it. The speech as a speech was, from the literary point of view, not strong at all I think, but it may be the most effective because it speaks to Lebanese people from different sects, or so it was intended. I have been saying that Nasrallah needed to address the Lebanese people given the intensity of the Saudi-Hariri-Israeli propaganda in Lebanon. This was clearly an address to the Lebanese people, addressing Lebanese issues and concerns (although he made an important point regarding the decline of the status and image of the Israeli soldier--he knows that this is an important point for Arab and Israeli public. And he as always cites Israeli sources so as not to sound bombastic a la Yasir `Arafat. He also said that Israeli "achievements" in Lebanon are not military but in the realm of "savagery"--good point). It is amazing how much of his talks on Lebanese matters during this war are directed--without naming him--at the propaganda of Saudi tool (former Iranian and Syrian tool), the well-known feudal warlord, Walid Jumblat. He mostly responded to the notion that Jumblat raised yesterday in an interview with Hariri Future TV, and in Ash-Shira' magazine (Ash-Shira` was a publication for Libyan intelligence, before serving Iranian intelligence, and now serves Saudi intelligence). Jumblat raised this question: To whom will Nasrallah present the "victory of the resistance?" Nasrallah responded today with a very Lebanese nationalist speech--even the poetic parts spoke of Lebanon's beauty, of its mountains, etc. He also was very keen on speaking in terms of Muslim-Christian unity, invoking the name of Jesus, and speaking of the notion of "love." Nasrallah, some people in Lebanon say, is at his best when acting as a Lebanese politician against his opponents in Lebanese politics. His address was meant to reassure the Lebanese public about the results of this war. Jumblat is nervous, and he is showing it. The Israeli calculations, and the calculations of its (direct or indirect) allies in Lebanon was that Hizbullah will come weaker out of this, begging for forgiveness. No signs of that whatever. If anything, the tide of public opinion seems to be swinging in Hizbullah's direction. I was astonished that after Nasrallah's talk, AlJazeera interviewed Edmond Sa`b (a right-wing sectarian Christian journalist with An-Nahar) and he spoke in emotional and glowing terms in praise of Nasrallah. Jumblat is sensing that. Nasrallah's stature is growing in the Arab world and inside. As Sunni columnist Nuhad Mashnuq (who broke with Saudi Arabia last Monday) wrote in As-Safir, it was unprecedented that a picture of a Shi`ite cleric (Nasrallah) was posted and raised in Al-Azhar during the last few weeks. Mashnuq spoke of the miscalculation by Saudi Arabia--that explains that sudden announcement of generosity by House of Saud. When I was in Lebanon last summer, I met off the record with a former advisor to King Faysal who used to pay various PLO and Lebanese leaders. The list is so big. But the advisor spoke in very respectful terms of Kamal Jumblat (not like his corrupt son, Walid who reads the New York Review of Books and brags about it because it makes him feel like an "intellectual") who refused all offers of Saudi money. In the house of this person, I saw two pictures: one of Kamal Jumblat and another of Hasan Nasrallah--and the person is a secular Sunni. I think that latest address by Nasrallah will work in Lebanese domestic politics: after the talk, Hariri deputy, Muhammad Qabbani, spoke and he distanced himself from Jumblat's comments. Personally, I can't stand any tributes to Lebanon as a homeland, or to Lebanese nationalism. I personally have always been opposed to Lebanon as a political project. It is too early for me to evaluate the status of Lebanese politics in the wake of this Israeli war of aggression, but I can't see how the Hariri Inc crowd will be able to come out stronger. It is clear that they are now weaker than ever, although Walid Jumblat still reads the New York Review of Books. And what is with Walid Jumblat always, as of late, attacking Noam Chomsky and "that person in the Knesset"--a reference to `Azmi Bisharah? 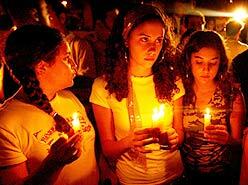 In other news, Israeli leaders are mourning the loss of Marun Ar-Ras--the pride and glory of the Israeli military. Israeli government is saying that its troops did not withdraw from Bint Jubayl and Marun Ar-Ras. 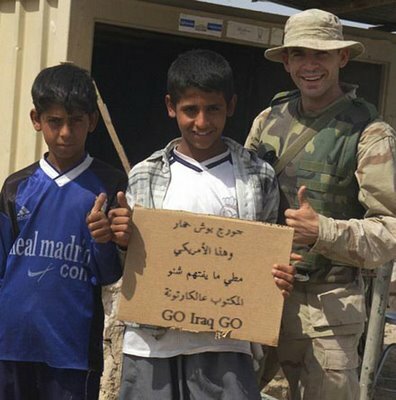 They merely "redeployed." Ya. When the US withdrew its troops from Lebanon in 1984, they also did not withdraw. They merely "redeployed." "A large oil spill and fire caused by Israeli bombing have sent an oil slick traveling up the coast of Lebanon to Syria, threatening to become the worst environmental disaster in the country’s history and engulfing this town in smoke. “The escalating Israeli attacks on Lebanon did not only kill its civilians and destroy its infrastructure, but they are also annihilating its environment,” warned Green Line, a Lebanese environmental group, in a statement issued Thursday. “This is one of the worst environmental crises in Lebanese history.”"
and my heart is a tree! up, but has it achieved results? the most splendid of dreams..
incredible of what is incredible"
My sources tell me that Walid Jumblat called Al-Jazeera's bureau chief in Beirut, and yelled in protest at AlJazeera's coverage of the war, and screamed: "You want to turn Hasan Nasrallah into a national hero"? He then slammed the phone. One insider commented to me that Human Rights Watch really wants the Israeli war of aggression to end, only because they don't want to have to take a stand. They will not. Norwegian Cartoon: "A Norwegian cartoon depicting Prime Minister Olmert as a Nazi commander indiscriminately shooting Palestinian Arabs in a concentration camp has elicited an angry response from Israel's ambassador to Norway, Miryam Shomrat, and a defense of the newspaper's editorial stance by its editor. The cartoon, which caused little uproar in Norway when it was first printed, has become a hot topic of discussion after Ms. Shomrat filed a complaint with the Norwegian Press Trade Committee arguing that the cartoon exceeded the limits of free speech." "Israeli propaganda, except in the United States where there isn't any other kind, doesn't work its old magic." Is there anything more offensive than Bush calling Israel's war of aggression on Lebanon "moment of opportunity"? "Israel’s Government has thrown its weight behind efforts by supporters to counter what it believes to be negative bias and a tide of pro-Arab propaganda. The Foreign Ministry has ordered trainee diplomats to track websites and chatrooms so that networks of US and European groups with hundreds of thousands of Jewish activists can place supportive messages. " "Israel's secret war: the humanitarian disaster unfolding in Palestine: Israel is waging a hidden war on Gaza, killing 29 people over the last 48 hours and turning the besieged Strip into a prison"
"An injured Lebanese boy with his mother after their van was attacked by Israeli aircraft as they fled their village in Tyre, Lebanon"
This passes as "analysis" in the Israeli "liberal" newspaper, Haaretz: "Before any international agreement, Israel must sound the last chord, launching a massive air and ground offensive that will end this mortifying war, not with a whimper but with a thunderous roar." Israeli Orientalism: "It is also turning the zealous Shiites into fighters who are ready to sacrifice themselves to sanctify the name of Allah. In 1988 Yitzhak Gershon was the commander of a Paratroops battalion that fought a bitter battle against Hezbollah at Maidoun. When he got back, he told his friends, "They aren't Palestinians. It's really hard with them."" " In the middle of the week, a close personal friend of U.S. President George Bush, who is also a generous donor to the Republican Party, called an Israeli friend who is a senior officer in the Israel Defense Forces. "What's happening with you?" he asked, as angry as he was disappointed. "The best army in the region, one of the best armies in the world, is messing for two weeks with a terrorist organization three kilometers from the border, and the rockets keep falling on its population centers? We sent our army to bleed 6,000 miles from home after September 11. What's stopping you?"" 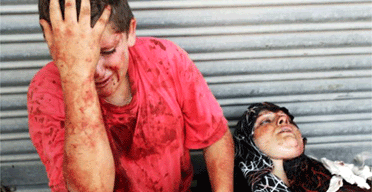 "With all these briefings, how does it happen that 400 civilians have been killed in Lebanon? Colonel A.: "There are 400 fatalities." You don't accept the definition that they are civilians? Colonel A.: "Our soldiers who are killed in Bint Jbail are also civilians." I can show you the pictures. This baby does not look like a soldier. Do you feel moral with 400 dead, of whom half are children, according to UN data? Colonel A.: "The answer is yes. We are not the only country that fights. I see how other countries fight, how the Americans fight, and I have no doubt that we are the most moral army in the world." 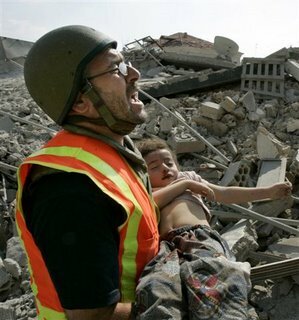 Israeli military men of conscience: "Colonel A. has not heard about civilian targets that were attacked. All the targets are "terror targets."" "Last weekend, 2,500 demonstrators turned out in Tel Aviv, but many were Israeli Arabs and radical left-wingers far from the political mainstream. A smaller demonstration in Haifa on Tuesday had to be postponed because air raid sirens wailed to warn of incoming missiles and protesters scattered to the shelters. Overall there is no traction to the anti-war movement." "US plans Saudi tank sale worth up to $2.9 bln"
Leftist intellectuals and writers in Lebanese issue a call for resisting Israeli aggression on Lebanon. I am 46-year old. I have lived through many Arab-Israeli wars and Israeli wars of aggression on Lebanon. I don't remember a time when Israeli propagandists were as confused, nervous, perplexed, agitated, and bumbling as those days. Unintended Consequences: Former Lebanese Prime Minister, Salim Huss, predicts that Hizbullah will emerge stronger. The Myth of the Israeli Soldier. The planners of this war on aggression on Lebanon clearly don't know much about Arab politics. They did not know how it will be evaluated by Arab public opinion. They assumed that Israel's savage will to destroy and kill on a mass scale--which was never in doubt, not in Lebanon for sure--is sufficient to subdue the Arab public, and to scare off potential resistors. But the battle is being measured by the actual combat between Hizbullah fighters and Israeli soldiers. And in that regard, something--without exaggerating here--has been shattered, no matter what will happen next. For decades Israeli propaganda and the propaganda of Arab regimes fed the myth of the mighty and invincible Israeli soldier. Israel wanted to discourage Arab armies from fighting them, and the Arab regimes wanted to instill fear and despair in their populations because they did not want to be dragged into a confrontation with Israel. This will be remembered by Arabs--rightly or wrongly--as a situation where Israeli soldiers ran away from Arab fighters, notwithstanding the fundamentally asymmetry between the two sides in everything. Arabs don't remember a time when Israeli soldiers were scared of Arab soldiers in contemporary times. The political impact of that will be significant. But don't get me wrong. Israel's long record of bravery against defenseless women and children remains intact. My friends know that I am not on good terms with Lebanese writer, Ilyas Khuri. But I wish to send him a comradely salutation for this piece. Here, Khuri offers criticisms of Harakat Al-Yasar Ad-Dimuqrati (of which he is a member, I think). Kudos. Cliches of Israeli propaganda. 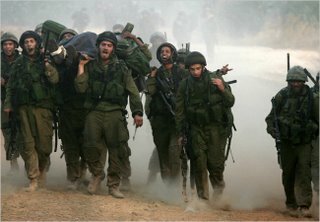 Having lived through many of Israel's brutal invasions of Lebanon, especially when there was no Hizbullah, let me share with you some of the cliches of Israeli propaganda in this context: "they are hiding behind civilians"; "the group--whatever the group is--is part of a Soviet (now Iranian) conspiracy"; "we harbor no ill feelings toward the people that we are killing;" "we can't have peace with terrorists"; "the enemy wants to destroy Israel"--Israel leaders say that as they go about destroying another Arab country; "they killed those civilians, not our bombs that fell over their heads"; "we are part of the free world"; "what about Hajj Amin Al-Husseini"; "Israel is the only democracy" [Cyprus is of course];" "our lives are much more valuable than Arab lives" [well, they don't say that, but it is implied in everything they say]. "The "hiding among civilians" myth"
Mini-Hariri continues his tour. He was in Tunisia today. I kid you not. "The 'Arab system' is dying in Lebanon"
The Guardian's Brian Whitaker knows the Middle East: "Arab leaders - especially the rulers of Egypt, Saudi Arabia and Jordan - have sustained further damage to their local credibility by not opposing the war more strongly. Though all three seem to be changing their tune slightly in the light of popular anger, many have accused them of adopting a soft line in the hope that Washington will reward them by not pressing hard for democracy and reform." But I have not read his new book yet. "Talk of a "new Middle East" from the US secretary of state, Condoleezza Rice, has also been greeted by Arabs with almost universal derision. One newspaper cartoon depicting "the New Middle East" showed an Israeli tank parked on the crushed remains of Gaza, Lebanon and Iraq." "Muslims unite in anger over Lebanon"
From a message I received: "Also, my sister in Beirut told me that in one school croissants were brought for the refugees but the boxes had Hariri's picture on them. The refugees refused to eat... and they were kicked out of the school." "Possible Loss of U.S. Citizenship and Foreign Military Service". But it seems that Americans may "enjoy" the military service of Israel. When Hizbullah uses the name "khaybar" for its missiles it only reminds Arab leftists why they can't--should not--support its ideology, no matter what the position toward Israel is. "A private US-Israeli company, Security Solutions International, is responding to the need for better quality training by sponsoring a training missions to Israel for US law enforcement and security officers." Haaretz: "Israel Defense Forces soldiers Ehud Goldwasser and Eldad Regev, who were abducted by Hezbollah on July 12, exposed secrets to their kidnappers, an Iranian Web site reported Thursday. The Web site, run by the former Iranian Revolutionary Guards commander, General Mohsen Rezai, says the troops revealed "secret IDF military maneuvers," including Israeli plans for a massive attack on Lebanon in the fall."" "Hezbollah's display of coordinated attacks and small-unit action is surprising the world community and making Western nations think twice about agreeing to put peacekeeping troops between the militant Lebanese Shi'ite group and aggressive Israeli forces, military analysts say." I can't believe that the Washington Times called Israeli forces "aggressive." Look what I have to read in the US press: "American does her duty with Israeli army". Can you imagine a newspaper with the headline: "American does her/his duty with Hizbullah"? That person would land in jail, you know. For history-repeating-itself moments, NBN TV has been replaying the pathetic comments that Bill Clinton made back in 1996 to justify the Qana massacre. The Arab people will not be able to struggle for enlightenment, gender equality, Palestine, real peace, dignity, real independence, secularism, social justice, and equality in the presence of the regime of the House of Saud. Of that I am more certain than ever. Israeli propaganda has often claimed that Arabs harbor hopes of "destruction of Israel." Well, Israel is actually destroying Lebanon, having actually destroyed Palestine. So who is destroying whom? Jihad Al-Khazin of Al-Hayat cited these figures on AlJazeera: 90% of Israeli deaths are military; and 90% of Lebanese deaths are civilians. "With the evacuation of Filipinos from war-torn Lebanon well into its second week, it is emerging that once again Filipino women are becoming the main victims. News reports tell of some cruel Lebanese employers refusing to let their Filipino employees go home because their contracts are not finished yet." So who wants war? The Arab public is calling for an immediate cease-fire, while the Israeli public wants more war and destruction. As for Zeef Schiff: well, that guy probably favors nuclear weapons to be dropped on Lebanon. Why is there no Lebanese calls for the resignation of Fu'ad Sanyurah? I mean this Laval did not even threaten to resign to force a cease-fire. That would have changed things. One of the main conclusions that the Arab public--if I dare say so--will draw from this war is this: that Israel--and I am not speaking only from the military perspective--is vulnerable. Very very vulnerable. Much more than what Israel and Arab regimes have led them to believe. This will have far reaching effects, politically and otherwise. So when they were planning this conspiracy on Lebanon, they said: OK, and then we will rely on the kings of Saudi Arabia and Jordan to lead Arab public opinion. We know how loved they are in the region. OK. Listen to the children. I have been particularly interested in what the children of the Lebanese refugees have been saying on Arab channels. Fascinating. There is a lot of anger, and a lot of political awareness. They all are able to identify the enemy, and all have tremendous anger. I will not cite some of what they have been saying, or urging. Remember that in 1970, Black September organization emerged. Hizbullah was born in 1982. Something new will be born out of this chapter of Israeli aggression, and Israel (and Zionism in general) should be held responsible for what emerges out of this carnage and destruction. Ilyas Khuri made a good point yesterday on AlJazeera. He said that Israel invaded Lebanon in 1972 because Katyusha were reaching Keryat Shmoneh. In 2006, when Israel invaded Lebanon, the Katyushas were reaching Haifa. A basic course in logic would lead you to draw conclusions. "Turkey and Saudi Arabia have stopped Iran using their air space to send humanitarian relief to Lebanon, media in Iran have said." "Lebanese wounded turn cold shoulder on Jordan aid"
"So bitter is Tyre's 70-year-old mayor over the war that he even refused aid from the U.S. Embassy this week. "From the U.S. government, I will not take," he said after a U.S. official called to offer help. "Even if they came all the way down from Beirut, I would not take it."" (In the print edition of the SF Chronicle (but not in the internet edition), the headline of the story is :"Bitterness grows in Lebanonese resort city". I swear. I thought a reader is playing a joke at the newspaper). So the New York Times has been eager, nay desperate, for any Lebanese opinion against Hizbullah. Hell, they have been citing Israeli "experts" in order to advance "theories" about the Lebanese people. And you remember the Bar Illan University professor who talked about clashes between "Khizbullakh" and "other southern Lebanese". But it is common in the US media to allow Israelis to speak for Arabs. Arabs can't speak for themselves, if you have not noticed. Here is one article in the New York Times. So where did the New York Times go for this? The village of `Ayn Ibil--the capital of Israeli collaborators and spies during the long years of Israeli occupation of Lebanon. I am not saying that all the people of `Ayn Ibil were collaborators, but this was notorious, just as there were towns that were notorious during the Nazi occupation of France. `Ayn Ibil was a stronghold of SLA. All Arab governments and Iran have been quite appalling in their behavior, to put it politely, during the Israeli war of aggression on Lebanon. They are either part of the conspiracy against Lebanon, or they are sitting idly buy washing the destruction of Lebanon, and hoping that their regimes remain secure. And I am in mood for those who want to make distinctions between Syria and Iran on the one hand, and the rest. Iran has not even announced any grant of financial aid. But in fairness: the Syrian Ba`th continues to produce its jarring Ba`thist rhetoric. Yesterday, the Syrian regime offered to feed the displaced people of Lebanon a stew of Ba`thist pamphlets and flyers. And then there are the glorious Palestinian people. The people who are the most oppressed and distressed have been the most supportive and generous. I am now watching a report on New TV about how Palestinian refugee camps in Lebanon have opened their homes for the Lebanese refugees. When it comes to Middle East coverage, what I read in the New York Times, I read a week earlier in the Economist, and two weeks earlier in the Arabic press. Take this for example: "Tide of Arab Opinion Turns to Support for Hezbollah." The NYT just noticed. Nobody unleashes the law of unintended consequences better than Bush: "Hizbullah support tops 80 percent among Lebanese factions"
The Lebanese Embassy in Washington, DC has canceled a fundraising event due to sectarian/political feuds among the embassy staff, and among the Lebanese community in the area. Israeli newspapers, especially in their military reports, read like Syrian newspapers at times of war. Notice how they just print uncritically Israeli military propaganda. Notice that in this article: they turn every civilian target hit into a Hizbullah target. Schiff now merely produces justifications for Israeli bombing of Lebanese civilians. Tomorrow, you will read him tell an important story: that two Lebanese babies were killed by Israeli troops because they were launching missiles at Israel. (Notice that he gave no evidence. He assumes that by mentioning the floor level, the story becomes convincing). This is how Islam is now presented to Western readers. When I read this, I miss the classical Orientalists. Unlike Karsh, they were at least learned, erudite, sophisticated, and quite knowledgeable. My stolen treasure..! My history..
so how can I forgive? Do not tell me..do not tell me..! Even tombstones have been scattered." Ayman Adh-Dhawahiri and the Saudi role in the Conspiracy. It is a sign that Ayman Adh-Dhawihiri showed up his face and gave one of his tedious fulminations--fortunately, all his calls fall on deaf Muslim ears. But it was public opinion pressures--even Al-Qa`idah feels them. This is a sign of what is building up among he Arab/Muslim public although I would never expect revolutionary momentum to topple regimes any time soon. But the new US/Israeli/Arab conspiracy required an Arab role in fomenting Sunni-Shi`ite divisions and seditions. The plan would have worked, had the US selected a more credible leader of Arab Sunnis than the Guardian of the Two Holy things. The Saudi King? Are you kidding me? He does not even speak for the Sunni House of Saud. If anything: whatever is supported by the Saudi King will be ridiculed and mocked by Arab public. Do you know how wildly detested the Gulf royals are? During the Arab Cold War, the Arab public threw its lot with Nasser. There was no mistake about it; even some members of the royal family joined Nasser--how much Prince Talal would like to forget that. What I find more noteworthy than Dhawahiri's statement--and it is significant in the way he falsely presented Al-Qa`idah as an organization that sought to unite Muslims (it was also significant that he used the Qur'anic term mustadh`afin, which was quite popularized by Khumayni)--is the statement by the well-known fundamentalist "thinker", Yusuf Al-Qaradawi. Now Qaradawi speaks for important segments of Muslim Sunni public opinion. His statement was made--in support of Hizbullah--as part of his taped Sunday show on Al-Jazeera. And AlJazeera made sure to air it today. But Nasrallah and Qaradawi--many people don't know--have been friends, or friendly, although Salafi groups attacked Qaradawi for his meetings with Nasrallah. And even the Muslim Brotherhood (not to mention Saudi intellectuals and clerics) in Egypt officially disagreed with the Saudi position on Lebanon. The Saudi position in the current conspiracy seems to be weakening: Saudi Arabia is showing signs of embarrassment and confusion. I don't think that brilliant planners of House of Saud--and US and Israel behind them, or ahead of them--expected the Sunni Arab opinion to be so solidly behind Hizbullah's stance in South Lebanon. They really expected--how foolish, come to think of it--Arab public opinion to rally behind Mubarak, and the two royal `Abdullahs. Say what you wish about Arab public opinion but it never rallied behind those royals. The sudden announcement of the Saudi financial gift to Lebanon--which it will not materialize, mark my words--was intended to beautify the Saudi image not only in Lebanon, but in the larger Arab world, more importantly. Similarly, Israeli bombers have allowed Jordanian planes to bring medical supplies to Beirut airport, also to help them out in this "PR" mess. What will this mean? Saudi Arabia is embarrassed, and that explains their last statement warning (the US, presumably) that things would get worse in the Middle East. If Hizbullah does not respond directly to the Saudi role in this conspiracy after all this is over it will only reinforce the view that they allow themselves to be used in Iranian foreign policy.